An overview of the construction of Tate Modern, the home of Tate’s collection of international modern and contemporary art. By the 1980s, it had become clear that Tate had outgrown its gallery at Millbank. In December 1992 the Tate Trustees announce their intention create a separate gallery for international modern and contemporary art in London. The redundant Bankside Power Station, designed by Sir Giles Gilbert Scott and built in two phases between 1947 and 1963, was chosen as the site for the new gallery. To find the best architects for the project, Tate organised an international competition which attracted 148 entries. After a two-stage shortlisting process the eventual winners were the Swiss firm Herzog & de Meuron who are widely acknowledged as one of the leading practices among the younger generation in Europe. They had already designed a number of widely admired buildings including the Goetz Gallery, Munich (1991–2), Ricola Europe Factory Building (1993), the Schüzenmattstrasse apartment building, Basel (1993) and the Railway Engine Depot and Signal Box Auf dem Wolf, Basel (1992–5). The transformation of the Power Station began in 1995 with the removal of the machinery and a number of out buildings. The building was left as a brick shell supported by a steel skeleton. The Construction Management method was used to construct the new gallery. The building work was split into distinct packages, each carried out by a specialist contractor. The Construction Manager, Schal (a division of Carillion plc) was responsible for the whole construction programme. Construction work began on the site during October 1997 when the concrete foundation was laid. At this point, a time capsule containing plans, photographs and videos relating to the project, as well as drawings by local schoolchildren, was buried in the foundations. A steel framework was built within the existing walls of the Power Station to create the seven gallery floors. This framework also supports the existing brick façade of the building. By autumn 1998, the building was watertight and a detailed fit-out of the space began and by August the following year, the galleries had been fitted out with environmental controls, permanent lighting had been installed across the building and the stairs and escalator had been put in place. In January 2000, the site was officially handed over to Tate from construction managers, Schal and the installation of the displays began. Tate Modern opened to the public on 12 May 2000. In total, the conversion of the Bankside Power Station into an art gallery cost £134 million. The Millennium Commission gave the project £50 million, English Partnerships provided £12 million for the purchase of the site, and Arts Council England gave £6.2 million towards the conversion of Level 4 into temporary exhibition space. Further investment was given by Southwark Council alongside donations from other private, public and charitable organisations. The Founding Corporate Partners Scheme was launched in 1998, a scheme where Partners make a commitment lasting up to five years and in return for their investment, gain exclusive benefits including entertaining, employee education events, private views and special access behind the scenes. 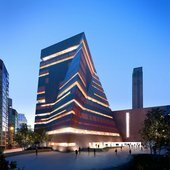 Part of the money raised from this scheme contributed to the building works at Tate Modern. Funded by Millennium Commission, Arts Council of England, English Partnerships (London), and Southwark Council.